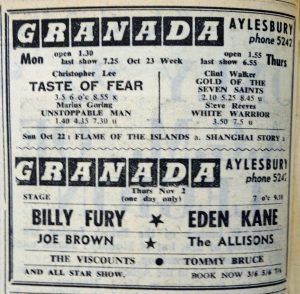 1961 saw seven more stage shows at the Granada Aylesbury. Ticket prices throughout the year were 3/6, 5/6 and 7/6. 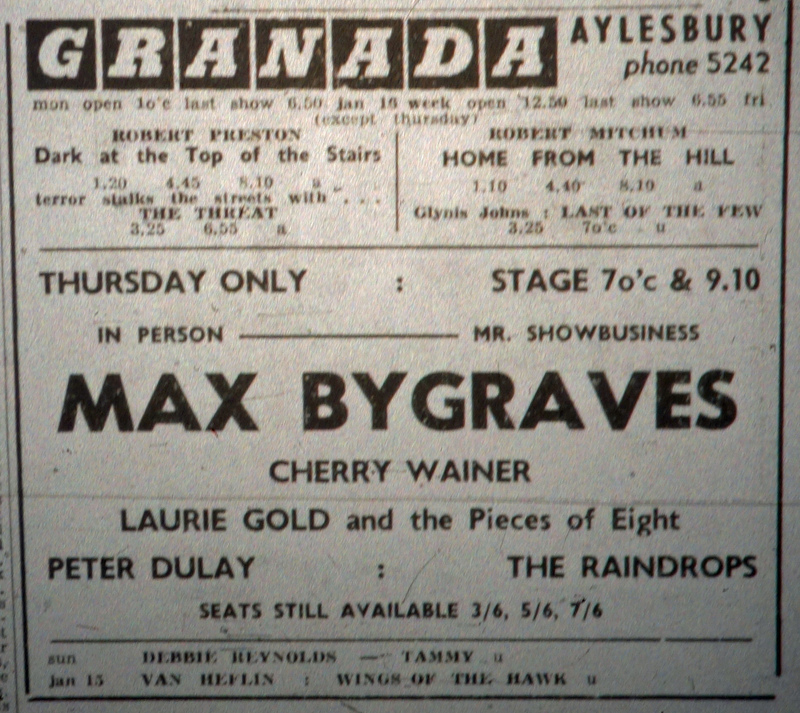 The first was on 19th January when Max Bygraves headed a bill that also included Cherry Wainer, Laurie Gold and the Pieces of Eight, Peter Dulay and The Raindrops. Gene Vincent was back on February 14th with the 1961 All Stars show. 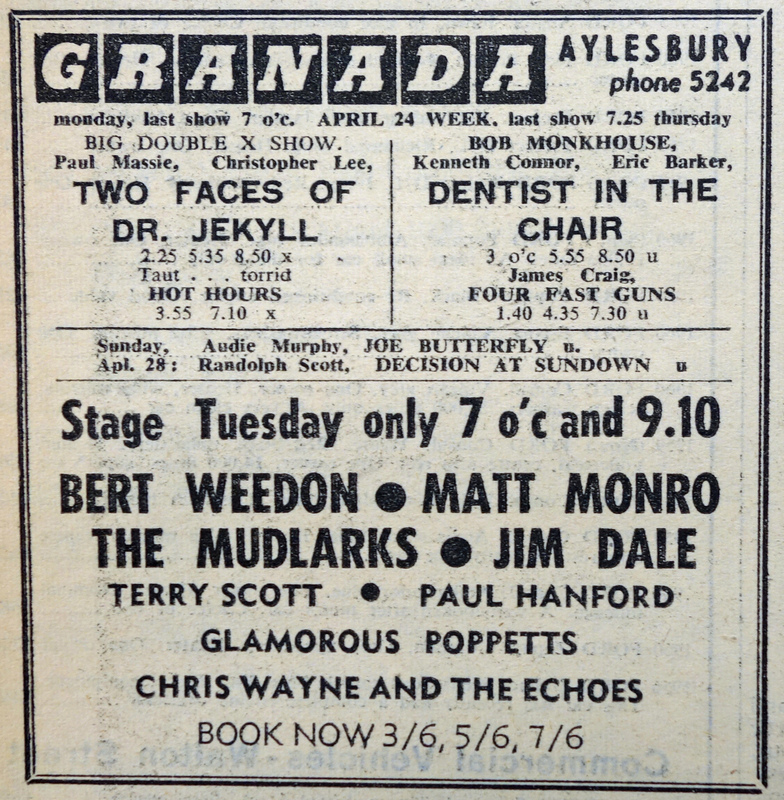 Also on the bill were Mark Wynter (later to have hits in 1962 with “Venus in Blue Jeans” and “Go Away Little Girl”) and Jess Conrad (described in the programme as “The Face on 1961”). Tommmy Steele was the star on 8th June. Tommy Steele is regarded as Britain’s first teen idol and rock ‘n’ roll star. He had a number 1 with “Singing The Blues”, and also became an actor. 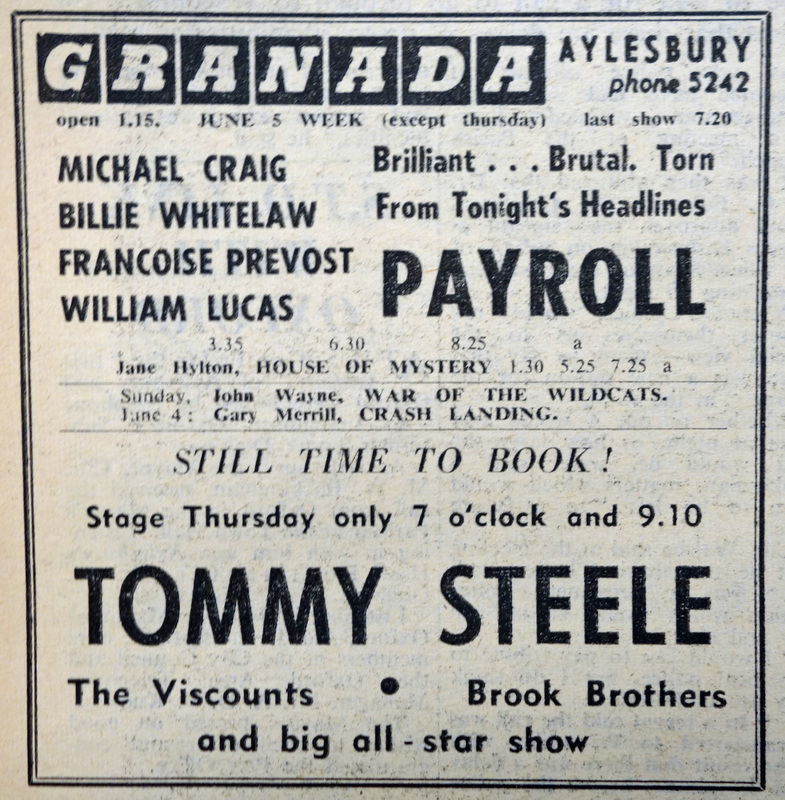 Tommy Steele, who at 24 might almost be called a show-business veteran, proved that he has what it takes to get ahead in the world when he starred in the stage show at the Granada, Aylesbury, last Thursday. For sheer entertainment value it was the tops for the audience. It was not only Mr. Steele who gained the applause, however, for this was an excellent variety show. 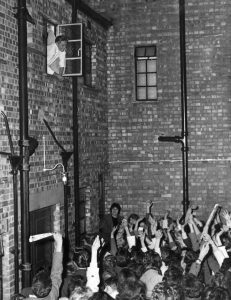 The Viscounts’ rhythmic singing and suprisingly proficient comedy impersonations must have attracted many new fans. 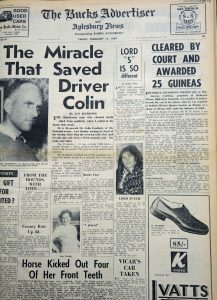 Singing star Tony Brent was a popular addition to the bill and Syd and Paul Kaye, Shirley Sands, Reg Thompson and Les Brazilianos completed an all-action programme. 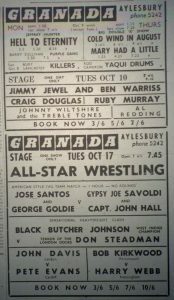 The next show on 10th October was headlined by comedians Jimmy Jewel and Ben Warris, who were cousins and had been working together as a double act since 1934. Music was provided by Craig Douglas and Ruby Murray. 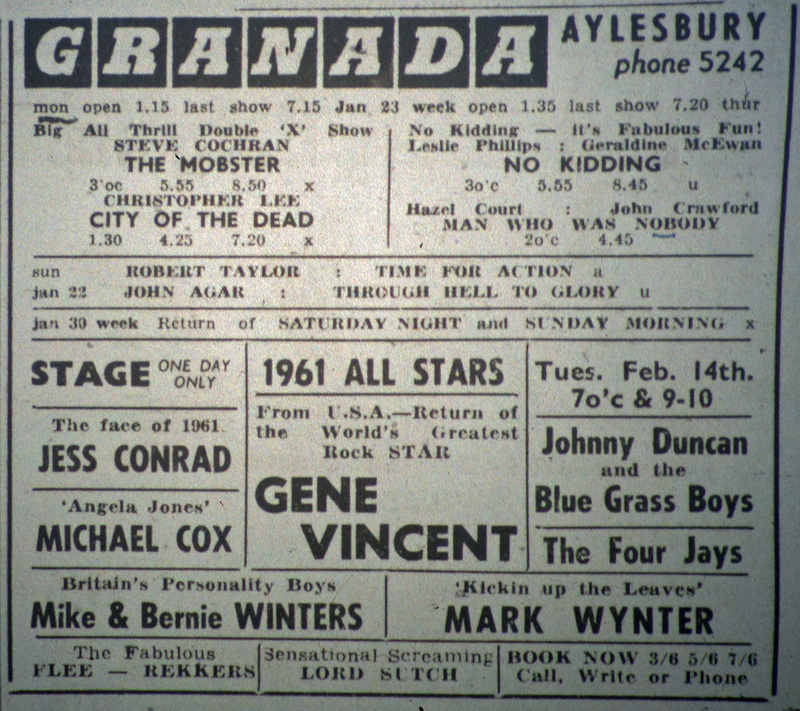 Note that the advert for the show also includes details of All-Star Wrestling at the Granada the following Tuesday. 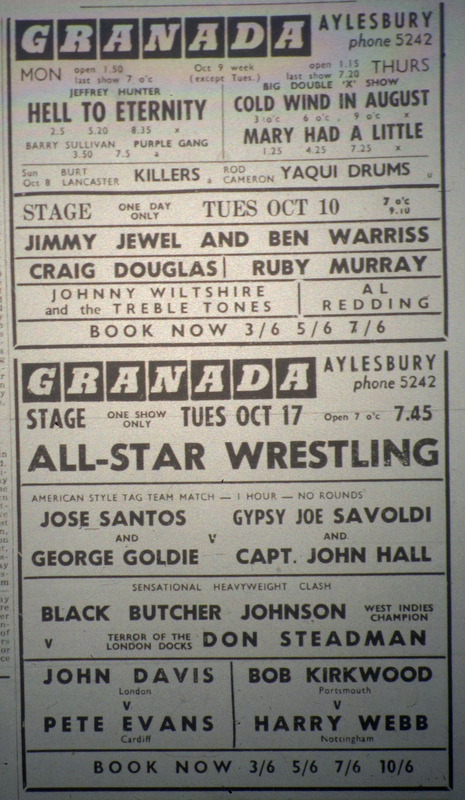 Wrestling had been introduced to the Granada in July 1960 – other Granada theatres on the circuit had been presenting wrestling for some time. 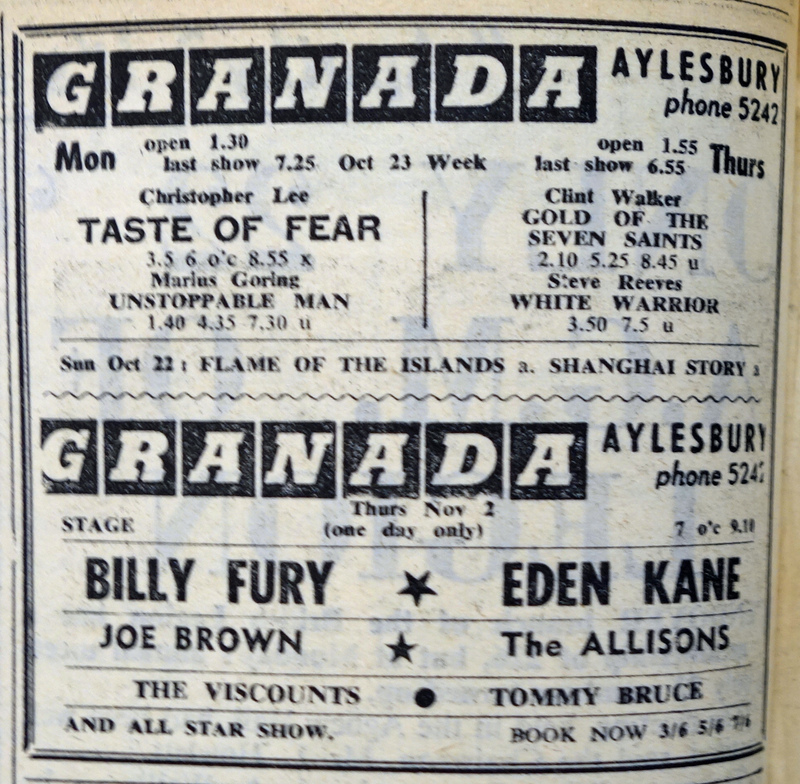 On 2nd November Billy Fury was the star of a show that also included Eden Kane and Joe Brown. How did it all begin? 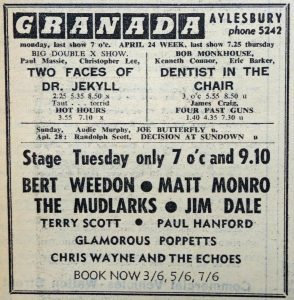 One rainy afternoon Billy called at a Birkenhead theatre where Larry Parnes was presenting a show. 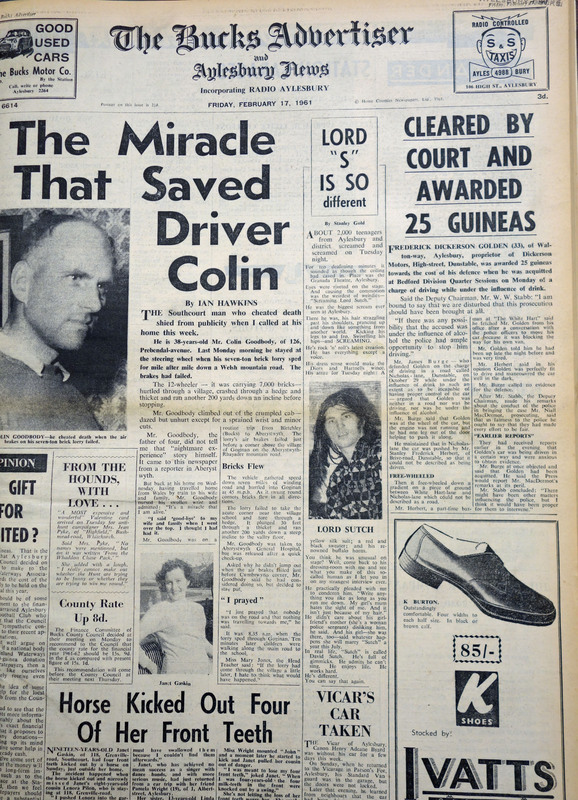 Clutched in his hand was a battered old guitar. He gave an audition and within half an hour he was on stage singing two of his own songs to 2,000 enraptured teenagers. 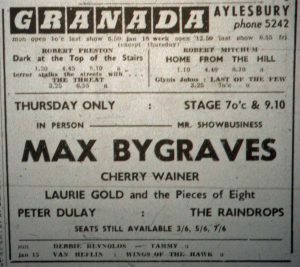 A few weeks later Billy’s first Decca recording, “Maybe Tomorrow”, was in the Hit Parade and he had become a regular member of the Oh Boy! TV show. 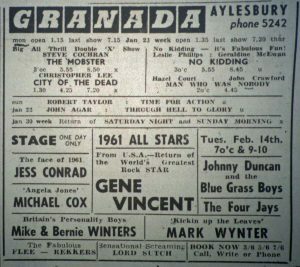 Larry Parnes felt that Ronald Wycherley – his real name – needed a stage name more in keeping with his other acts, which included Marty Wilde, Johnny Gentle and Dickie Pride. After some argument, Ronald Wycherley became Billy Fury. The Allisons represented the UK in the Eurovision Song Contest in 1961 with the song “Are You Sure?” – it came second and got to number 2 in the UK charts. 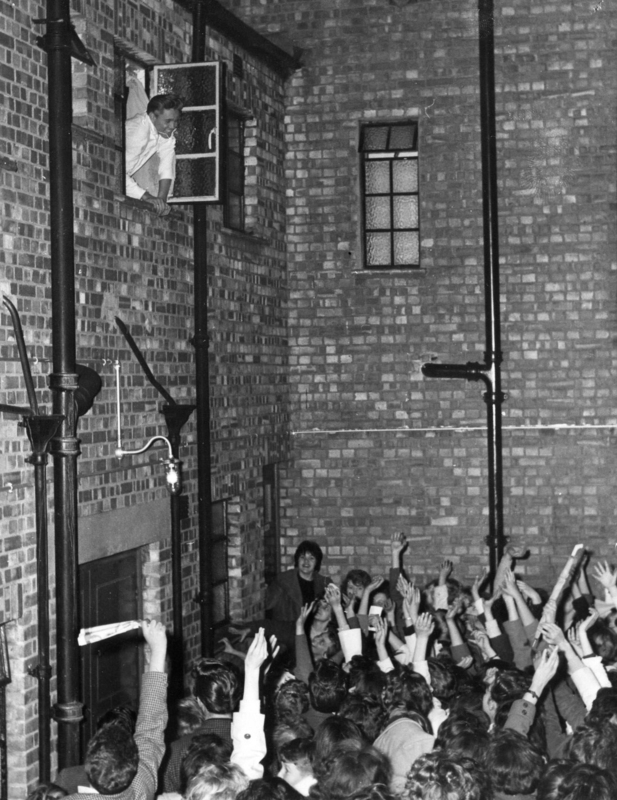 Below: Billy Fury is seen greeting fans from the window (click on image to enlarge). 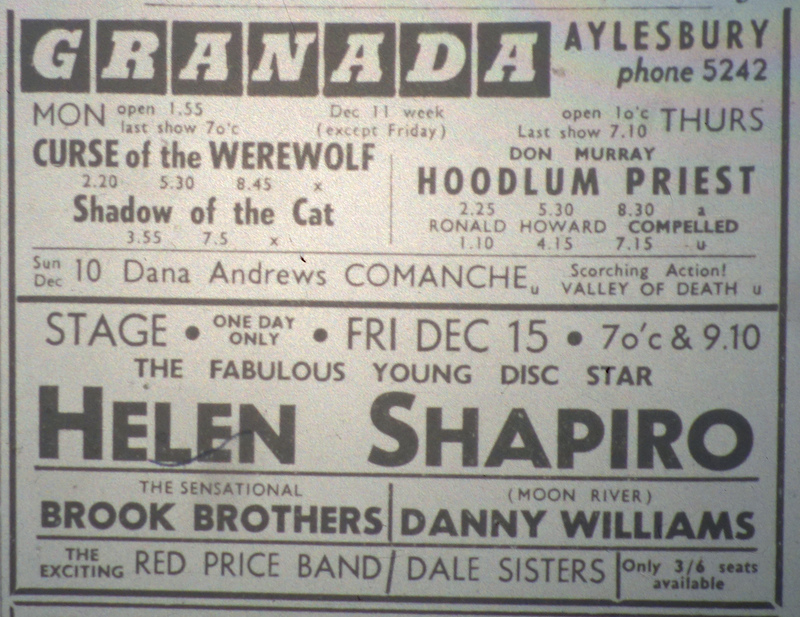 Helen Shapiro headlined the final show of the year on 15th December. Also appearing were the Brook Brothers, Danny Williams, the Red Price Band and the Dale Sisters. 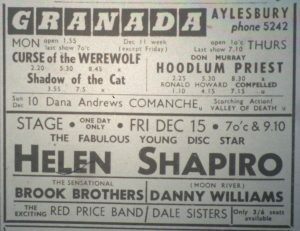 It was a foggy evening and the Bucks Advertiser reported that Helen Shapiro left London at 5 p.m. but didn’t arrive in Aylesbury until 9:30 due to thick fog. 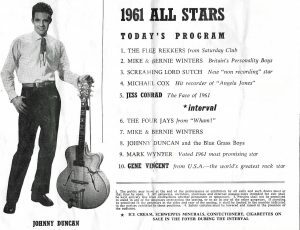 Danny Williams had a number one single with “Moon River” in 1961.